Growing up in the plumbing business I have seen a lot of changes. Plumbing fixtures and styles have changed a lot. The efficiencies of low flow toilets, touchless faucets, and water less urinals are just to name a few. Fixtures are cosmetically pleasing and can provide quite a nice finishing touch to the kitchen or bathroom these days. The other day I was visiting my grandmother’s home for a family get together. 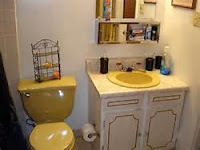 While I was passing the bathroom the colored fixtures in her bathroom happen to catch my eye. Peach! Everything was peach, the toilet, basin, and the bath tub. Oh my! I started thinking about all the colors I have seen in customer’s homes through the years. Avocado green, harvest gold, canary yellow. I’m not sure what our parents and grandparents where thinking!!! It’s a scary thought because history tends to repeats itself. Can you imagine an avocado or harvest gold jetted tub? With all the things in life that seem to go in cycles the faucet I hope to never see again is the white kitchen faucet. However, if you are one of the few who still has a white faucet. Manwill Plumbing and Heating a call. We can keep your faucet working as good as new and keep you in style for the near future. Finding a good plumbing service is a very important first step. Plumbing problems can occur day or night, so knowing which plumber you will call is a good idea. Good Job! I enjoyed enough reading your latest article to read it again and again! It was so helpful. Waiting for your next entry. Since furnace is a source of heat, it is very dangerous to mess with it, given the fact that it’s inside harbor high voltage and intense heat. Before anything else, safety consciousness is a must.